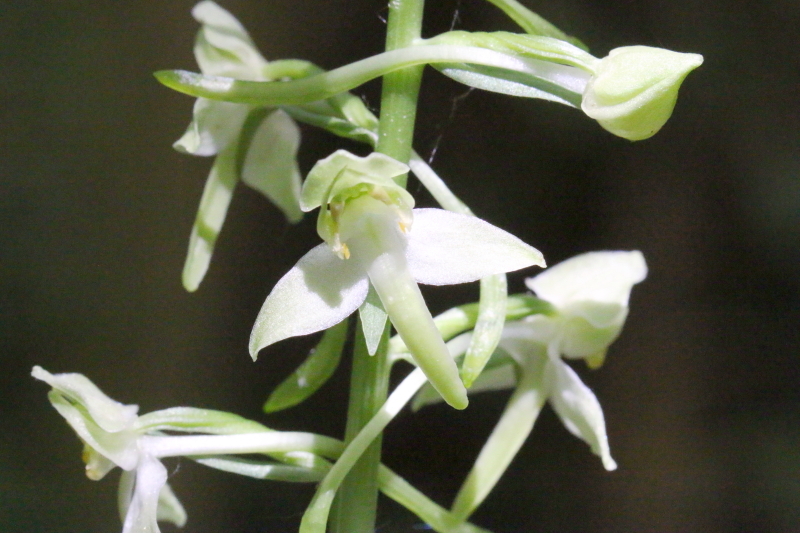 The Greater butterfly orchid is quite majestic. 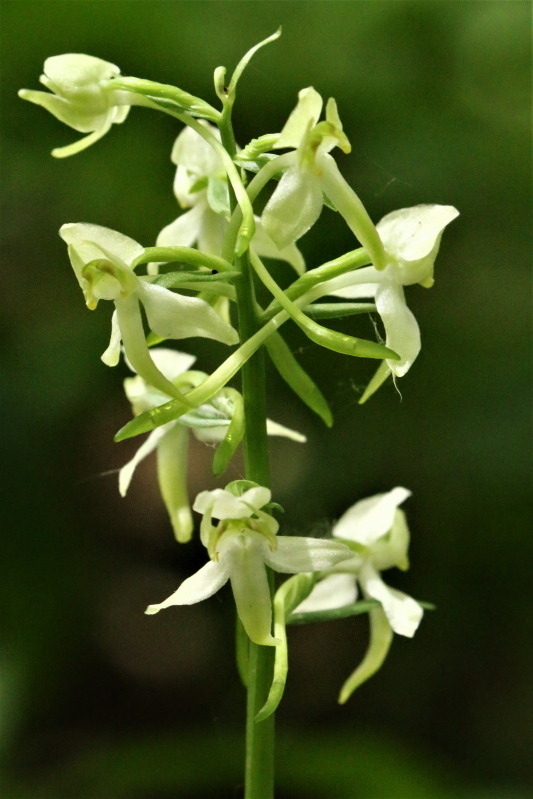 However it can be overlooked as it often grows where bluebells have flowered and at the time the orchid comes into flower which is late May/June the bluebells have gone over and the orchid which is white or greenish white gets hidden by the now fruiting bluebell spears with their developing seed heads. However once you see them they are quite special. The BSBI (Botanical Society or Britain and Ireland) distribution maps show that it has been recorded in several tetrads along the Wye valley area but not much north of Ross on Wye, also there is only one record to the east, away from the immediate vicinity of the Wye and that is in the Mitcheldean area. 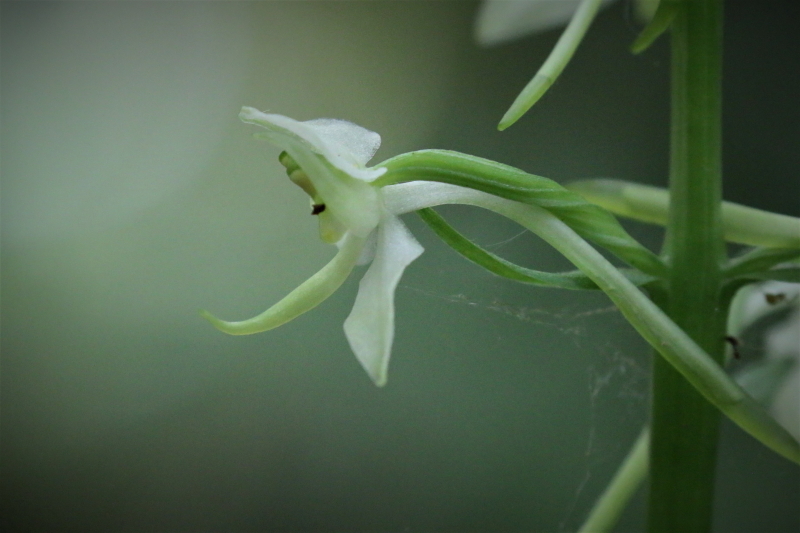 There are two Butterfly orchids, greater and lesser and they are very similar. 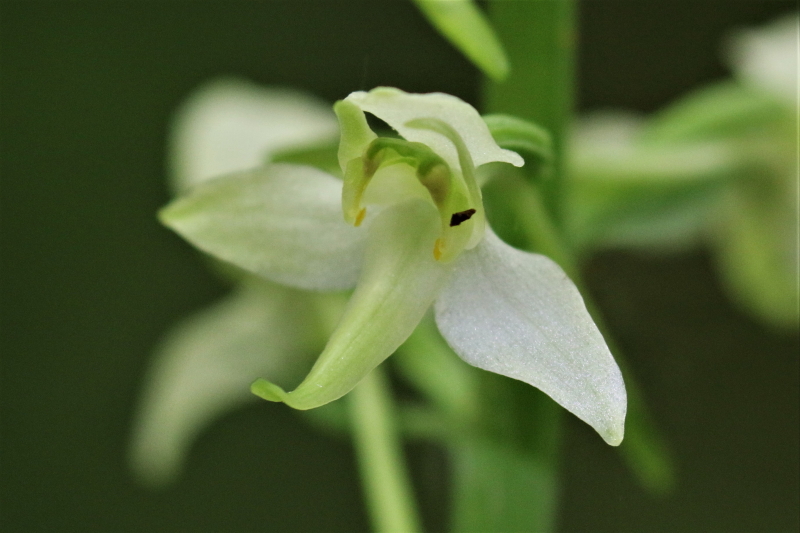 The difference is that the pollinia on the Greater butterfly orchid spread out to form an inverted ‘V’ shape whereas in the Lesser Butterfly orchid they hang down and are parallel to one another. So you need to look carefully. Indeed its scientific name Planthera means spreading anthers. The pollina turn brown as they get older, you can see this in the photo above. 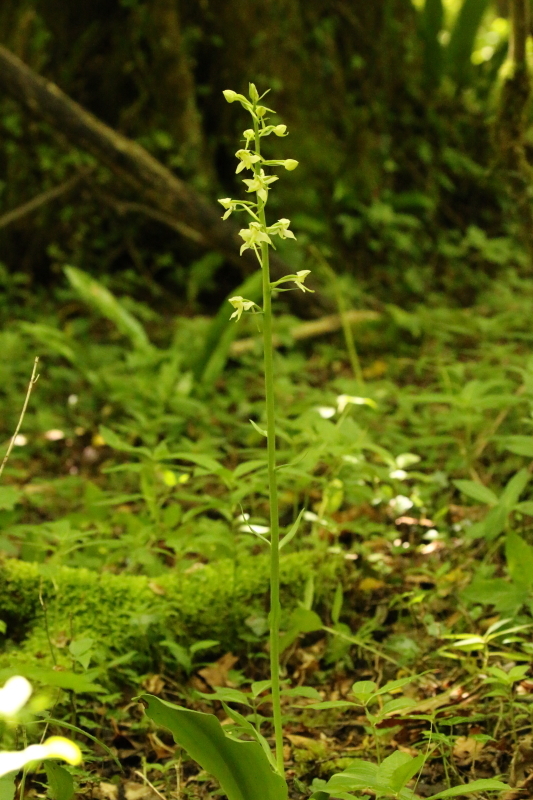 They grow quite tall, up to 50/60cm and have two or three large leaves at the base, somewhat resembling those of Twaybalde, but then they also have a few little spear shaped leaves up the flower spike. The flowers are loosely arranged and usually number about 10 or so. As I said they are white but do have some green markings and in the deep shade of the woods they often look slightly greenish. The flower stalks which become the ovary have a peculiar spiral twisted look and the flower also has a very long spur, suggesting that it is pollinated by insects with a vey long tongue. In this photo you can see the spur extends back well past the main flower stalk.